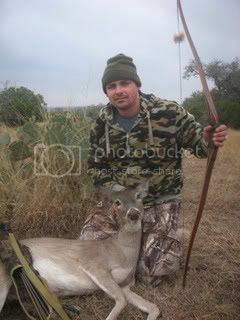 The year went out with a bang for me.I was fortunate enough to kill this doe in Texas on the last day of the year.She appears to be at least a 2 1/2 year old and was a wily lady that took a lot of luck and patience to line things up so that I would have the opportunity to take her. The story can be read in the official Solana thread.Thanks for looking. Congrtas Izzy! It was nice visiting with/meeting you at the ranch. Congrats on a trophy doe! so it's 2 deer in 2 days? nice winning streak you got there! !